This short jungle trek is an unforgettable experience for travelers with limited time! We also recommend this tour for families with children and people who are not able to take on great physical efforts. In about four hours you will nevertheless experience the beautiful nature of the rainforest and see some fascinating wildlife. During this trek you have a big chance to see Orangutans and other wildlife as well as a wide variety of plants, trees and insects. 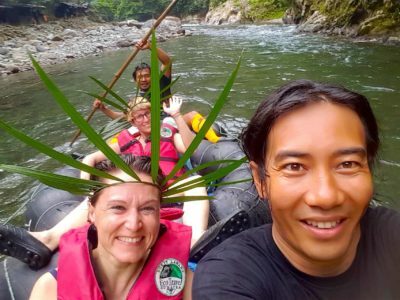 This is a great jungle adventure for sportive travelers with little time! 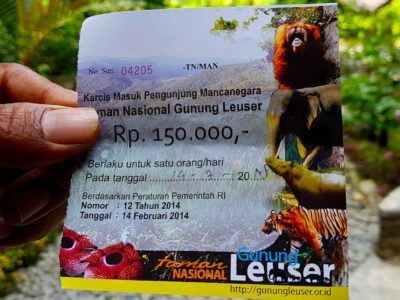 During this 1-day trek you will hike up and down the hills of Gunung Leuser National Park while having a big chance to see wild animals in their natural habitat. This trek takes around six hours - followed by traditional fun rafting by tube down Bohorok River. A great experience with real jungle impressions to take home! 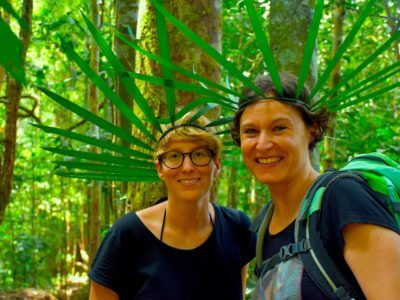 We recommend this tour for everybody enjoying a hike in natural tropical rainforest. Experience the real Sumatran rainforest with an adventurous overnight stay in the Gunung Leuser National Park. At a peaceful campsite on a river bank your dreams will be accompanied by the natural melodies of the jungle. 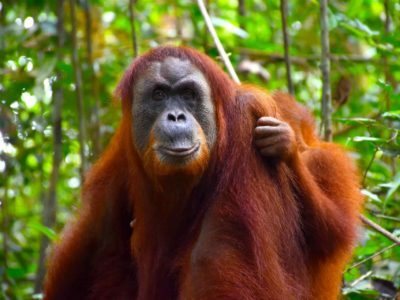 During this trek you have a big chance to see Orangutans and other wildlife as well as a wide variety of plants, trees and insects. We recommend our 2-day trek for sportive travellers who want to experience the nocturnal jungle life. On this 3-day adventure jungle trek you will explore the unique vegetation of the rainforest. On this trail your "jungle eyes and ears" will be “trained” on various endemic plants and dominant bird-sounds. 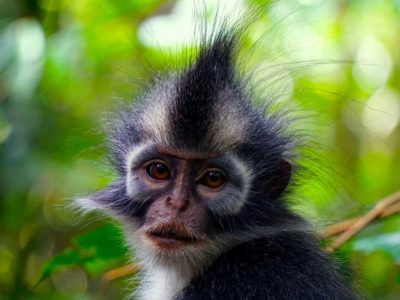 There is also a big chance that orangutans, gibbons, Thomas leaf monkeys, pigtail macaques, flying squirrels, Sumatran peacocks or hornbills might cross your way. You will stay overnight on two different campsites in the jungle. For this tour you need to be physically fit. 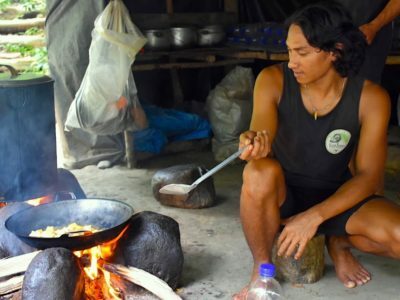 Meeting orangutans, planting trees & supporting villagers: This tour is a real Eco-trek - a unique combination of jungle trekking in Gunung Leuser National Park followed by a trail along the Landak River and an overnight stay on a campsite by the edge of the rainforest. The next morning our guests will plant trees together with villagers. We like to describe this tour not just as an outdoor adventure but as an educational and ecological experience! This tour will take you rather deep into the jungle! You’ll stay overnight in different camps and learn jungle survival techniques. 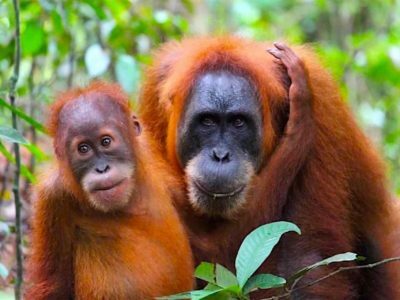 While hiking up and down the hills and crossing small rivers you have the great chance of spotting a huge variety of wildlife – animals such as wild orangutans, gibbons, Sumatran Great Argus or hornbills. And if you’re lucky you might see elephants or even foot prints of Sumatran tigers. For this tour you need to be really fit and healthy. This 5-day trek gives you a unique experience of life in the rainforest. You will roam really deep into the jungle and stay overnight at different camps in Gunung Leuser National Park. 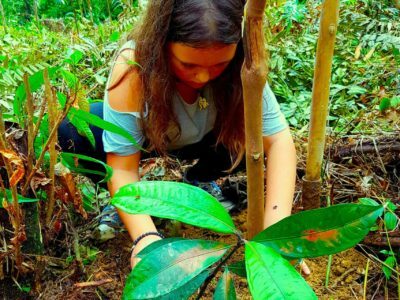 While hiking up and down the hills and crossing rivers you acquire traditional jungle survival knowledge. If you are lucky there is a chance to see elephants or even foot prints of Sumatran tigers! For this tour you need to be really fit and healthy enough to trek for several hours each day.